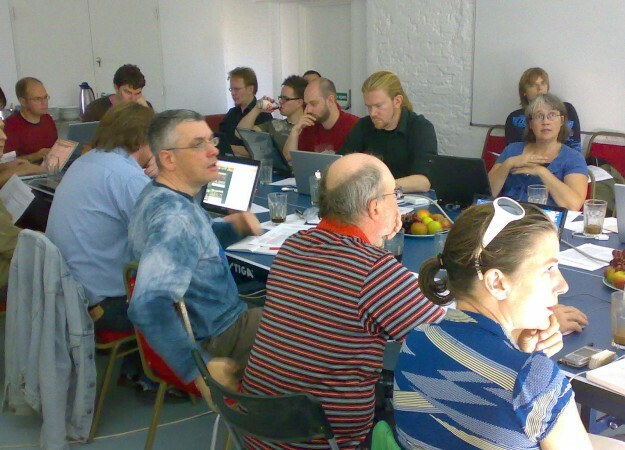 The Integrated Project on Pervasive Gaming (IPerG) was an EU funded project from September 2005 to February 2008. Blast Theory was a lead partner alongside Nokia, Sony Net Services, the Swedish Institute of Computer Science, the University of Nottingham, the Fraunhofer Institute, the Interactive Institute, the University of Tampere and the University of Gotland. It's Alive, later Daydream, were partners during 2005-6. Pervasive games are games that extend in time, space or social effects. They might last days, weeks or months and therefore occupy a different place in the lives of players than traditional games. They might be played across whole cities or countries: the rise of mobile devices and location technologies such as GPS has driven this development. And they might extend socially so that, for example, non-players are inadvertently part of the game. Blast Theory has pioneered games like this. Uncle Roy All Around You invites players to explore the streets of the city and culminates in a contract between two players picked at random in which they undertake to offer advice or support to one another if either player has a personal crisis in the next twelve months. In this way the game shows spatial, temporal and social expansion. IPerG aimed to create entirely new game experiences, which were tightly interwoven with our everyday lives through the objects, devices and people that surround us and the places we inhabit. The approach was to create several showcase pervasive games, develop new tools and demonstrate new markets. Blast Theory’s contribution grew over the course of the project as it emerged that we had expertise not just in designing games but also in production, development, localisation, translation and implementation that was widely applicable. Our perspective on artistic and theatrical precedents for pervasive games was also part of a lively discussion with some of the most distinguished theorists of pervasive games in Europe. The IPerG web site documents the main findings of the project and its public documentation – publications, deliverables and dissemination materials.